One of the most difficult things for a leader is knowing when it is time to vacate their position and turn the reins over to someone else. As a CEO, ministry leader, or commander of a military organization, there can be several reasons why you “the leader” need to consider stepping down from the job and allowing a new face to take over. In the military, this decision is generally made for you. Occasionally a commander fails to perform, or something has happened that is contrary to the moral beliefs of the individual and that is why command may change. I’ve seen leaders replaced for both reasons, but a majority of the time a change is because of a promotion or he or she has fulfilled the normal time for being in that position. In these cases, a leader leaves with honor and thanks of a grateful nation. Leaders in corporate organizations depart either because the business changes to an extent that the person no longer has skills or interest that fit, because the leader recognizes a new opportunity, or because the board of directors wishes to try a new face hoping for better results. These situations are visible with high profile corporations, but what most people don’t realize is that so many businesses continue to proceed through varying economic conditions over the span of many years with leaders who successfully build their organizations with sound performances that enhance the lives of employees, investors, and customers. Jim Collins’ book Good to Great, has many examples of these companies and leaders who have done just that; steadily improved over the years. Knowing when to depart a position of leadership in a ministry can be for reasons other than age, but with or without age, leaving a ministerial position can be because you “the leader” have just run out of energy, run out of years, or because the culture and times no longer align with your skills. For ministry leaders who feel you have simply run out of energy, a sabbatical may be in order. I’ve often wondered why ministries have sabbaticals and the reason is usually those who lead as a follower of THE ONE, do so with less compensation and a willingness to work longer hours because of faith and passion. On the other hand, as age sets in, your skill set may wane, and you do develop real limitations on the hours you can devote to service. However, the lesson here is that for those of you who lead a church, para-church, or charitable organization, take time to sharpen the saw, continue with professional development, and take time off to think, pray, and contemplate what the Lord has in store for you and your organization. No matter your position or type organization, if you were called by Him to serve but you feel it is time to step away from your leadership position, that does not mean you have stepped away from serving. Remember you always, Lead to Serve and Serve to Lead. There are any number of ways in which the Lord may want you to serve Him in a new and different capacity. Your new organization may be smaller, you may just volunteer, or your position may be a little more humbling, but the impact you can continue to have as an “Elder at the Gate” with those coming behind can be immense. Never give up and when your time is up, you’ll gain an even greater calling, that of being in the presence of your Lord and Savior, Jesus. So, time goes in a completed circle and as Solomon said in Ecclesiastes, “What do workers gain in their toil? He has made everything beautiful in its time. He has also set eternity in the human heart; yet no one can fathom what God has done from beginning to end.” (Eccl. 3:9-11) Your next step, your next time; it can be beautiful. 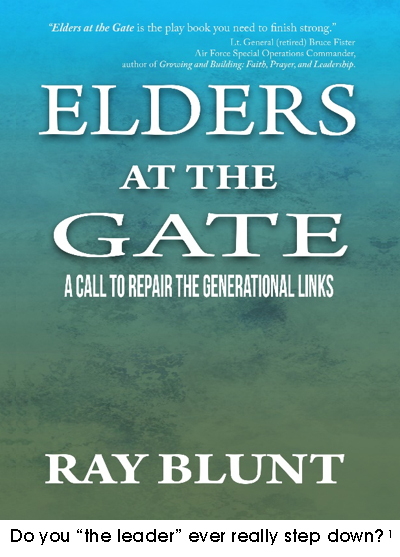 Look for Ray Blunt’s book Elders at the Gate to be released this November and follow his Blogs at https://www.elderatthegate.com/home-1/ and for my book, Growing and Building and Blogs go to Growingandbuilding.com. Armerding, Hudson T., The Heart of Godly Leadership, Crossway Books, Wheaton, Illinois, 1992, pg. 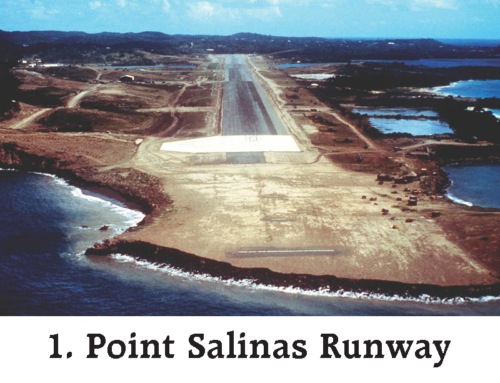 195.